If you’ve ever wanted to talk to your lamp, GE’s new C by GE lamp has Alexa baked right in. 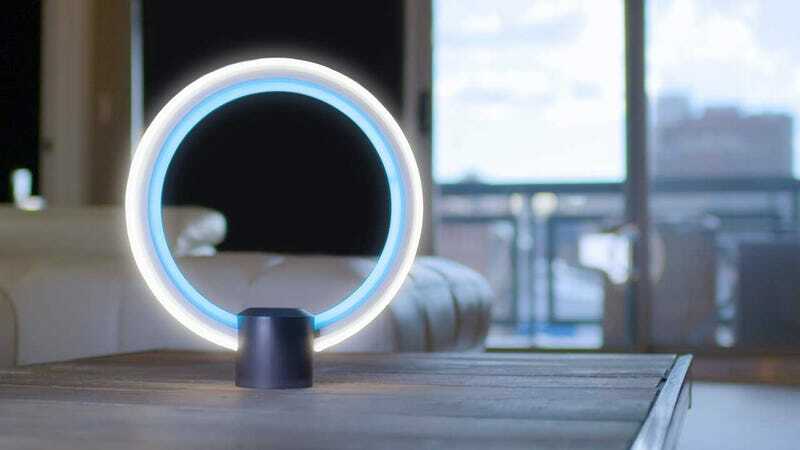 Amazon has licensed its Alexa assistant to a slew of different gadgets, but this is the first lighting product to feature the voice-controlled service. The circular LED lamp will launch in the second-quarter of 2017. It includes a microphone and a speaker, so you can talk to your lamp, play music from Spotify, and perform any of the dozens of Alexa skills currently available—from ordering pizza, to ordering an Uber. You can use Alexa to turn the C’s own lamp, which will be incredibly useful when you’re fumbling around in the dark. And of course, Alexa also integrates with other third-party lighting solutions like Philips Hue bulbs, which means you could conceivably turn on the lights all over your house just by barking at your lamp. The lamp doesn’t require anyone to own an existing Alexa product or hub, just plug it in and go. There’s no word on pricing yet, but you’ll be able to pre-order in early 2017 and GE has a website offering updates. I’ve actually been looking for a good bedroom lamp and having one with Alexa built-in could replace both my lamp and my Echo Dot, that could be an even better solution.